Gorgeous, modern, well equipped lodge in beautiful setting and with access to 4 star, 70 acre resort facilities. Available Saturday to Saturday for best rates. 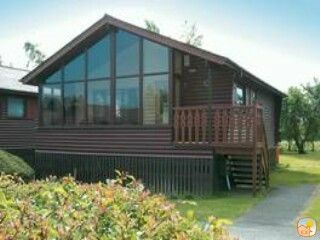 Pine Lake Resort is a stones throw from the Lakes, Heysham and Morecambe and is built around a 70 acre water sports lake. It offers sporting and entertainment facilities including a leisure center with heated pool, jacuzzi, steam room and gym, a water sports center and fishing areas, tennis courts, and children's activity play areas. The lodges are centrally heated and comprise: Summer room, open plan lounge/dining room with digital color TV, video, and hi-fi. Fully fitted kitchen with electric oven/hob, fridge, freezer, washer/dryer and microwave. Double and twin bedroom. Bathroom with shower over bath, hand basin and WC. Pine Lake is the perfect base for touring. It is only minutes drive away from the motorway. Windermere and the central lakes are within a half hour drive. The Yorkshire Dales are within easy reach and for a day at the seaside the resorts of Morecambe, Silverdale and Arnside are less than 10 miles away. The clubhouse has a restaurant, bar and separate room where organized entertainment is arranged. There is an on site shop and the reception has a wide selection of DVD's for hire. Lodges have pine clad interiors, front and rear terraces with patio furniture and gas barbecues. Private parking. All gas, electric, bed linen and towels included. Cot available. Pine Lake Resort has an abundance of leisure facilities on offer including a leisure center with heated pool, gymnasium with jacuzzi and steam room, a water sports center and private fishing area, tennis courts and children's activity play areas. Growing up overseas, my family visited Pine Lake every year during the summer holidays. As children, we loved the site - there was just so much to do and we were afforded so much freedom by parents knowing that the resort was so safe. Our summer holiday ritual was halted when Pine Lake became a time share resort. We bought one of the small number of privately owned lodges on site and have continued to visit sine. A host of activities for children and adults can be found within the resort. Kids can safely play on site while parents relax knowing that they are in the relative safety of the resort. Pine Lake Resort was originally a timeshare resort (Diamond Resorts) with a small number of lodges falling under private ownership and some of these being available for rent. Pine Lake lodges are situated around a 70 acre lake watersports lake. Lodge 66 has a more private rear veranda set in well maintained gardens and with views out over the river Kier and fields beyond. Kitchens are fully equipped with everything you could reasonably expect to find at home. Lodges are well equipped with almost everything you would expect to find at home. The lodge is very well cared for and has everything you could want. It is also very spacious. The resort is also very quiet on an evening which we liked. Our 5yr old loved the swimming pool and the crazy golf on site. Perfectly placed for trips into the Lake district, to Arnside and Silverdale, Lancaster, and we especially enjoyed the beach at Heysham. Can't fault it for the money, I hope we will be able to visit another year. My wife and I and our 4 year old daughter loved the lodge. Very spacious,clean and with a great kitchen. Owners are also very friendly and helpful. Site is excellent too with great pool and nice bar/restaurant area. Pine lakes is also handily located for Lake District, Yorkshire Dales and Blackpool ! Lovely location, perfect for exploring the surrounding area. Staff all wonderful with lots for kids to do. Kids disco from 7:30 each night in clubhouse and pool area well kept. The cabin was well equipped, clean and tidy. The onsite facilities and little resort are also kept neat, tidy and it looks like some things have been updated recently. We used the gym, the pool and the sauna and the girls (teenagers) did water sports on the lake and had beauty treatments, both of which they absolutely loved. We went on some great walks in the Lake District and around the Arnside and Silverdale AONB and opposite side of the water in Grange over Sands. The girls also went to Go Ape in Grizedale Forest (again, loved it) and we all went on a boat trip from Bowness to Ambleside. If we came back again we would also take a trip to Yorkshire. There is definitely something for everyone here and I would recommend this property as it is a good base. Pine Lake Resort is built around a 70 acre water sports lake. It offers both sporting and entertainment facilities including a leisure center with heated swimming pool, jacuzzi, steam room and gymnasium, a water sports center and fishing area, tennis courts, and children's activity play areas. The clubhouse has a restaurant, bar and separate room where organized entertainment is arranged. There is an on site shop and the reception has a wide selection of videos for hire. Booking weeks run Saturday to Saturday. For the most competitive pricing please ensure that your break falls within a booking week. Pricing for breaks spanning more than 1 booking week reflect the loss of additional weeks. Short breaks may be available out of season. Prices are subject to change. Lodges are available from 3pm and keys can be collected from reception which is open 24 hours. Keys must be returned to reception by 10am when you leave.